This site is primarily about an unusual collection of over 3,500 photos of Sydney taken whilst walking every street, lane, bush track etc in 292 suburbs of Sydney. There have been over 4,695,000 pages viewed by over 1,749,000 visitors from 184 countries (latest new one is Sao Tome and Principe) - see Visitor Countries for full list..
Alan Waddell was encouraged by his doctor to take up walking. After a while, repeating the same route every day became boring. 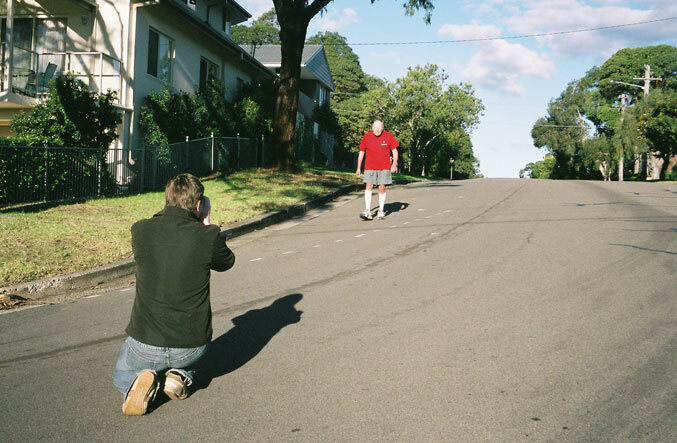 So Alan Waddell decided to walk every street in his own suburb. In December 2002, this idea of walking every street was expanded to include neighbouring suburbs and so his odyssey began. Following is an excerpt from this 380-page book published this month by Dr Ian Pollard, actuary, Rhodes scholar, Australian tennis representative and company director. My family, of all ages, were inspired by our late friend Alan Waddell's self-reinvention. After the death of his wife, Marge, Alan began walking the streets of Sydney. In the last six years of his life, from the age of 88 to 94, he walked every street in 284 suburbs. He gave his first ever public speech (reputedly the challenge many people fear most) at 90 and became an international celebrity, regular TV guest, public speaker and inspiration to many - young and old - especially in encouraging people to do more walking. His website <walksydneystreets.net>, still maintained by his sons, has to be seen to be believed. Back in February 2008 we were amazed to see that our web site, walksydneystreets.net, was listed first out of 390 million entries for a Google world search of the word 'walk and first out of 83 million entries for a search of 'walks'. This has continued throughout 2008 with only one or two interruptions. As 2008 draws to a close, our web site is still listed first out of 313 million for 'walk' and first out of 61 million entries for a search of 'walks'. Click here and here for images. The Herald has a daily half-page story, called "Timelines", about a usually well-known person who has recently died. Today's page concentrated on Alan's unusual early life experiences, as detailed by lifelong family friend, Ian Pollard, and the series editor. The obituary can be seen here on The Sydney Morning Herald's website or here on walksydneystreets.net. 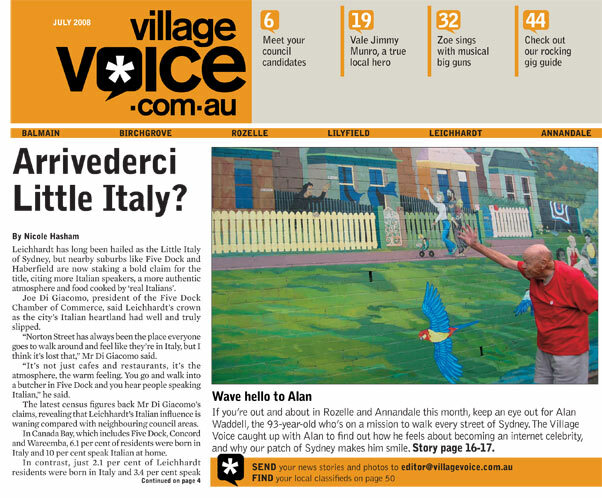 The inner western newspaper's tribute to Alan showed him next to Sydney's most colourful traffic signals box. A segment about Alan's walking life was shown nationally this morning in Nine's Today show. Alan's family greatly appreciate the kindness shown to him by all journalists and photographers. They made him feel at ease, even though he was always very worked up before any media request. This was because he worried that he would let them down by being too nervous to speak properly or not being able to carry out the wishes of the photographer.. The same item was carried by Brisbane's Courier Mail. 702 ABC Sydney and 92.5 ABC Central Coast broadcast an interview with Cumberland Newspapers' editor-in-chief, Simon Holt, in which he said that everyone should get out on the streets and go for a walk in honour of Alan. Tributes were also broadcast by 2GB and 2CH. The Standard named Alan as "one of [its] favourite personalities" in its 11th item about him. Alan died peacefully at 3.00 this morning from complications after a successful hip replacement. In memory of Alan we will retain the site and continue to add accumulated photos of his discoveries. We trust that this will still help to brighten your day and encourage exercise in the interests of better health. The number of items about Alan in the Standard hit double figures with their kind story wishing him a speedy recovery from his approaching hip operation. DCM ran two stories about Alan in its May issue. 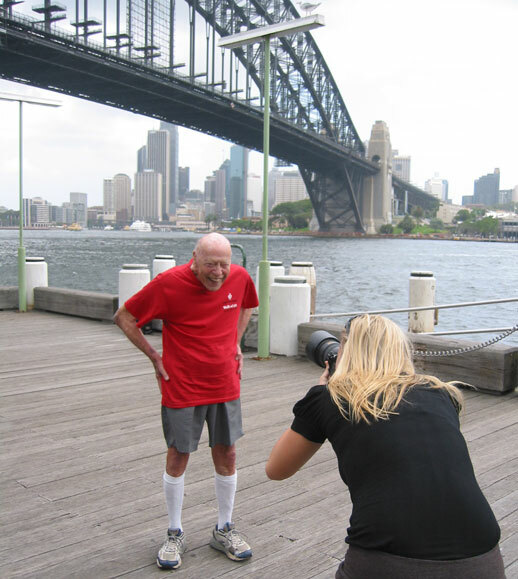 The cover invited readers to "Meet Sydney's Best-known Walker. He's fighting heart disease on foot - at 93!" The magazine has a circulation of 150,000 through Australian pharmacies. The editor, Tiffany Bonasera, interviewing Alan. The May edition of this magazine, with a circulation of over 350,000, carries an article about letterboxes (on page 151!). It includes some of Alan's photos, and advises that "if you're fond of letterboxes that are quirky, intriguing or a touch bizarre, then check out [this] website." 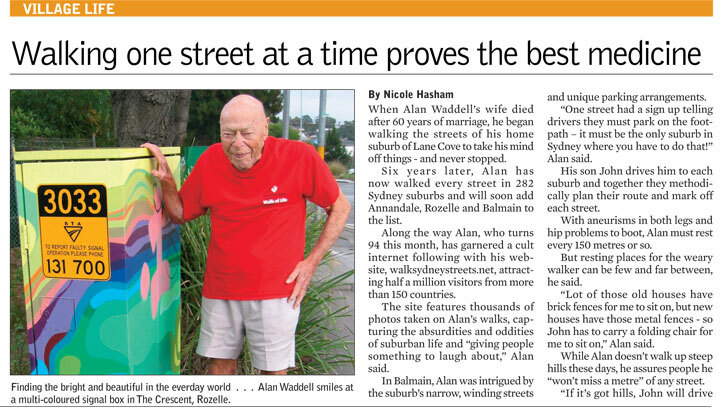 The Courier reported that "North Shore residents can go for a walk and talk with 93-year-old Alan Waddell" the next day. This was part of Seniors' Week activities. Alan kicked it off with an illustrated talk about the health benefits of walking and the discoveries that you make on foot rather than driving. We were amazed to see that our web site, walksydneystreets.net, was listed first out of 390 million entries for a Google world search of the word "walk" today. It was listed first out of 83 million entries for a search of "walks" and it was eighth for a search of "Alan". Click here and here for images. By combining articles about Alan from stablemates Mt Druitt and St Marys Standard and The Mosman Daily, the North Shore Times was able to run a double page spread on his walking. 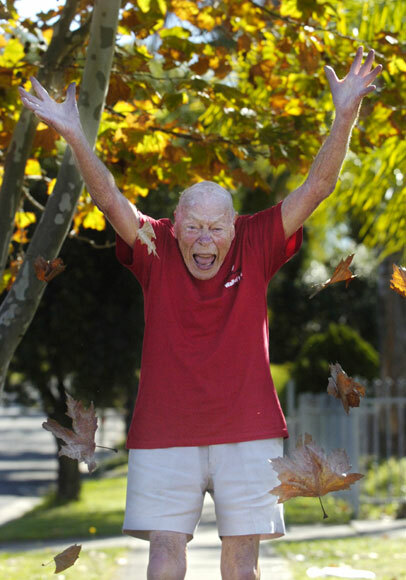 Nine reporter Dale Paget was there as Alan completed his 250th suburb, Northbridge. The event was promoted by a video on the network's web site and covered in their 6pm news (also screened on Qantas flights). 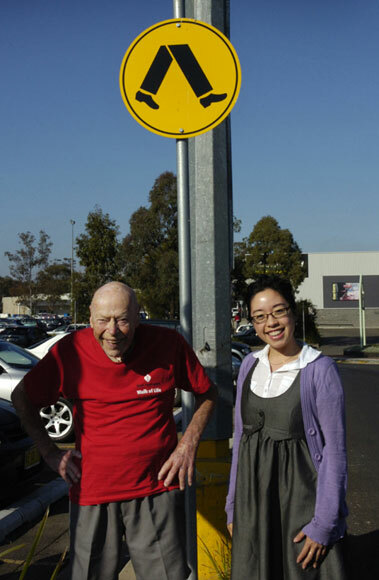 The Town Talk column, now edited by Lana Lam, reported on a visit to their newspaper's office by a lady who had recognised Alan. "Alan Waddell has become quite the local celebrity as he makes his way through our suburbs. Bidwill locals Pat Wain, Penny Thomas and Margaret Johnson even got their picture taken with him last week." Journalism student, Michael Cleggett, chose Alan’s walking for his final year assignment. The Standard recorded that "Alan has been told by his doctor that his heart is in such good condition that he should reach 100 years." This was the second in a series of small items about Alan's progress in walking the suburbs in the distribution area of the Standard. They are appearing in Paul Tatnell's popular Town Talk column, which records quirky local events.